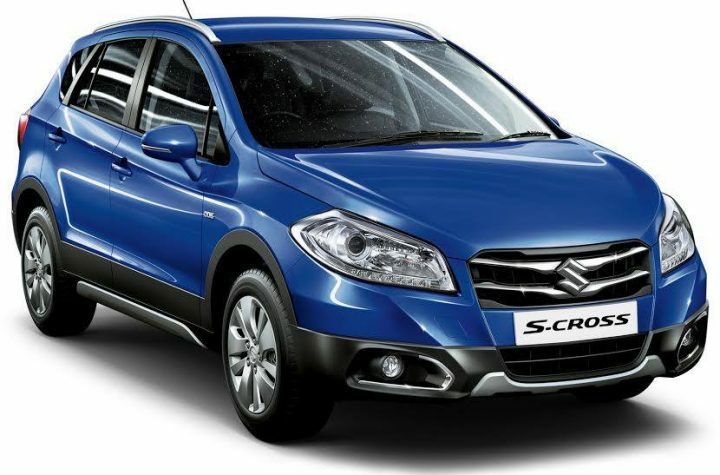 Maruti Suzuki India has finally taken the wraps off the upcoming S-Cross crossover which is slated for a launch this month. As expected, the India spec S-Cross has not undergone much change in comparison with the Euro-spec model save for a new grille and alloy wheel design. Based on first impressions, it is undoubtedly one of the most interesting models Maruti has launched in India yet. It isn’t merely a hatchback with high ground clearance and plastic cladding slapped on it, the S-Cross was engineered to be a crossover. Here we have come up with a Maruti S-Cross review of design and we shall be taking you through the exterior, as well as the interior styling of the much talked about crossover in detail. The Maruti S-Cross will be sold exclusively through the new NEXA dealership channel and will be targeted at the buyers looking for a premium crossover. The exterior styling of the Maruti S-Cross is clearly more hatchback than SUV. This could be due to the fact that in Europe car buyers prefer a more car-like design for their crossovers rather than a butch SUV shape. One of the reason why the Ford EcoSport has been so comprehensively outsold by the Renault Captur over there. Up front, there is a trapezoidal grille, much like the Ritz. Although it is exactly the same in shape as the Euro-spec model, the upper half gets two chrome slats which house the Suzuki insignia. The lower part of the bumper gets black cladding which also houses the round fog lamps and some chrome detailing. The headlamps seem a tad too big, especially the ones without the projector units and LED daytime running lights which will be used in the lower spec trims. There is a strong character line which starts around the fog lamp region, goes around the lower part of the headlight and continues along the side all the way to the rear tail lamps. When viewed from the side the S-Cross’ SUV credentials are more evident thanks to the visibly large ground clearance and the faux skid plates, which are also present at the bottom of both bumpers. The aforementioned character line can be seen stretching from light to light and it helps in reducing some of the bulkiness of the S-Cross. The alloy wheel design isn’t the most attractive one around and the thick spokes make them look like wheel covers instead. The Maruti S-Cross looks best when viewed from behind. The usage of chrome is virtually nonexistent on the boot lid which is surprising from Maruti. We like it, but we’re not sure if the chrome loving Indian audience would. Unlike the headlamps, the split tail lamps do not look oversized, but they are quite reminiscent of the Ford EcoSport. Most of the rear bumper is covered by black cladding complimented well by the faux skid plate and reflectors. 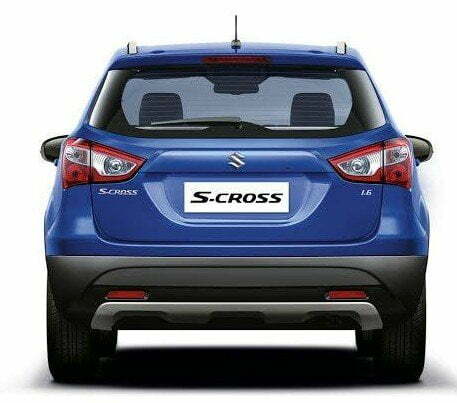 There is no Maruti Suzuki badging on the boot lid, just the S-Cross name, Suzuki logo and a 1.6 badge indicating the engine option. Other notable features include a sculpted bonnet, silver finish roof rails and side mounted ORVMs with neatly integrated side indicators. Step inside and you will be greeted by a classy, all-black interior with a very tasteful application of silver accents all around. The hexagonal instrument cluster houses the AC vents and infotainment system which is either a button operated one or a touchscreen. Strangely, though, the non-touchscreen double DIN audio system looks better than the touchscreen which give it a rather barren look. Placed below the centre console is a neat dual-zone climate control. The steering wheel has been lifted off the Swift and gets the standard audio and Bluetooth telephony controls. The simple instrument cluster gets two large dials- speedo and tacho, with a small multi-information LCD display placed in between. The front, as well as the rear bench is upholstered in black and get a centre armrest and adjustable headrests as well. The large window area keeps the rear from getting claustrophobic. The Maruti S-Cross is definitely not the most striking looking thing around and might not turn many heads, but it isn’t a turn off either. Yes, the headlamps are a tad too big and it does look more of a large hatchback, but it was intended as a hatchback based crossover which the design manages to do quite well. It will be interesting to see how the Indian audience reacts to this soft looking crossover, especially since most customers buy SUVs/crossovers for their looks. Powering the Maruti S-Cross are two diesel engines- 13. litre and 1.6 litre mated to 6-speed gearboxes. No automatic or AWD system on offer yet.